Confucius said that a thousand-mile journey begins with a single step. 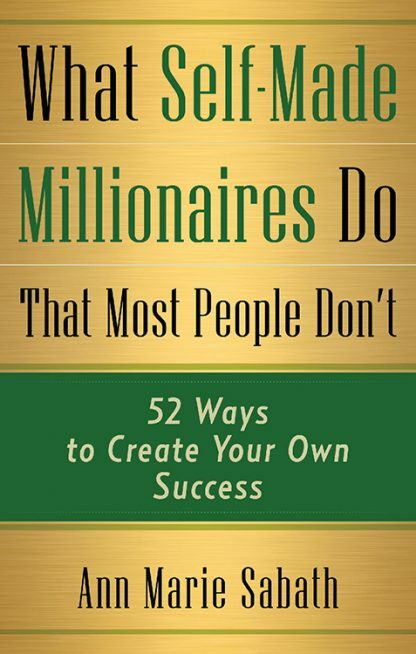 The same principle applies to becoming a self-made millionaire, except this journey is a little shorter, comprising just 52 common sense practices. Featuring interviews with a wide-ranging list of self-made millionaires, you will be astonished to see how anyone can achieve this status by creating the right mindset. You will learn how white-collar professionals, blue-collar workers, small business owners, even teenagers alike have joined this million-dollar net worth club by methodically and consistently putting into practice the self-made millionaire game plan revealed in this book. In What Self-Made Millionaires Do that Most People Don�t, Ann Marie Sabath makes it easy for you to implement these simple strategies by posing a question at the end of each section to help you begin your own self-made millionaire journey. How to create a self-made millionaire mindset. The 25 habits all accomplished individuals have in common. Powerful advice for anyone ready to begin their self-made millionaire journey. OK, you�ve been given the rod, now go fish! Ann Marie Sabath is the founder of At Ease Inc., a 30-year-old New York�based business consulting firm. Sabath has given more than 200,000 individuals representing Fortune 500 companies across the globe that added polish to help build their organization�s profits. Her goal for writing this book is to now assist individuals in learning how to become masters of their own personal success. She is the author of Business Etiquette and other business titles for Career Press and has appeared in numerous media, including Oprah.